The opium poppy is a hardy annual that grows to about 1.2m with large, coarse, toothed, silvery green foliage and tall flowering stems bearing four-petalled flowers that may be white, pink, lavender or red, followed by a globose capsule with an operculum that opens to scatter the ripe seed. The wall of the green capsule oozes bitter white latex when wounded. Opium cultivation is strictly controlled in many countries and is the source of some our most important pain killers, morphine and codeine, but also of dangerously addictive heroin. All varieties require a well drained soil and sunny position. To sow seeds evenly during spring, mix them with dry sand. You need to weed regularly. Harvest and dry the petals immediately after the flowers fully open. Collect seed from ripe capsules and dry them. 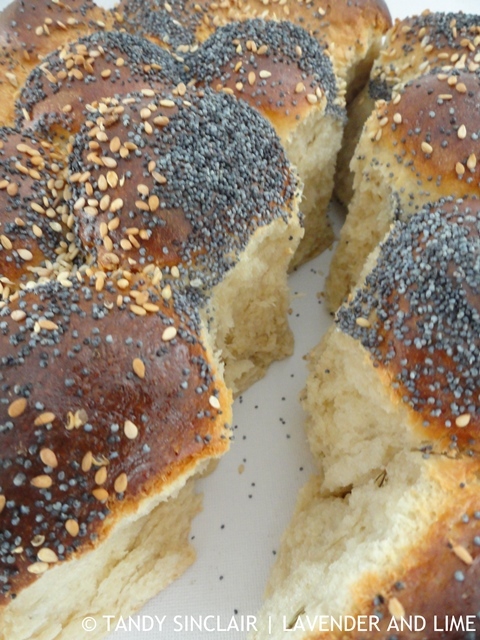 Poppy seeds are not narcotic and are widely used for their flavour and crunchy texture. They are popular in baked goods, such as breads, cakes, pastries, muffins and bagels. In India the seeds are ground and used to thicken sauces. The seeds also feature in Jewish and German cooking. Ours grow wild, so maybe you can pretend they just arrived? I love poppies…their delicate petals are so beautiful and vibrant. I love poppies and was sad to miss them in the fields this year, such a lovely sight! Poppies are a real favourite, just beautiful and just what I needed to see on a rainy day Tandy! I love poppy seeds. They have a flavour all their own. O love poppie’s a lot! So colourful & we see them a lot in our countryside, in the wild! Another goo post, Tandy.I love poppyseed muffins, but not when the seeds get stuck in my teeth. 🙂 Have a lovely weekend.